“So what if abortion ends life?” ??? Also at the same link above is the transcript you can read if you prefer. One last point. God doesn’t acquit the guilty, but if we put our trust in Jesus, He gives us the free gift of Jesus righteousness. HE wipes away our sins when we ask Jesus to be our Lord and Savior, because HE laid those sins upon Jesus and our sins were paid in full by Jesus at His death on the cross. Thus our guilt wasn’t acquitted, but paid for by Jesus. Posted on September 26, 2015 October 9, 2015 Categories AbortionTags Abortion, Bible, Exodus 20:13, Exodus 23:7, human life, Mary Elizabeth Williams, Matt Chandler, Murder, The Village ChurchLeave a comment on “So what if abortion ends life?” ??? It has been a long couple of years here. My blog has been on the back burner due to taking care of a very dear family member who was dealing with progressive dementia. I’m not sure if I’m truly ready to jump back into writing posts as yet since my grief related to his passing is still strong. For now I’m testing the waters. Looking to see who is still reading my posts. If you have gotten this far and are willing to interact, please leave a comment below and/or take a moment to vote your choice in my poll. Do you have an Eternal Perspective? Is it important? In his article, “The Important of an Eternal Perspective”, Randy Alcorn of Eternal Perspective Ministries touches on why he believes looking at things in light of eternity is important. The Importance of an Eternal Perspective – Blog – Eternal Perspective Ministries. Posted on December 18, 2013 Categories Christian Walk, Non-FictionTags Eternal Perspective Ministries, Randy AlcornLeave a comment on Do you have an Eternal Perspective? Is it important? ‘The Harbinger Decoded’ gives a brief highlight of each of the Harbingers recorded in ‘The Harbinger’ book. It gives a brief explanation of how ancient Israel and the United States have taken parallel courses in history and how the judgements given to ancient Israel are now being given to the United States as well. Jonathan Cahn is a messianic rabbi who was given a message for the United States. A warning that Christians need to hear and heed. Obviously, when God goes to the minute detail to get a warning out as He did in this case, it is very important that we get that warning out to as many as possible. This video is good as a stand alone for those who get their information audibly rather than reading. My one concern is the background music is a bit too loud for anyone with hearing problems. It tends to mask the message a bit. Since the message is so important, I’d love to see the publisher come out with a version that tames the music some so even those with hearing issues could get God’s warning in full too. My only other thought on the video is that since it is a warning to God’s people, it should be put into the public arena in a way that cost isn’t a limiting factor in getting the message out. The Juice Lady’s (also known as Cherie Calbom) ‘Big Book of Juices & Green Smoothies’ is not only a recipe book with more than 400 recipes, but a tool to help the reader realize the goal Ms. Calbom dreams of helping others achieve and that is radiantly vibrant health. She includes a couple of testimonies in the introduction. One from a woman who had severe health issues whose life was turned around by juicing and the other from Ms. Calbom herself. Her testimony is inspiring. The first chapter is what she calls, ‘All about juicing’ and that pretty much covers it. Lots of details and instruction on juicing. Then starting with chapter two she fills each chapter with numerous recipes, and yes more tips and training. This book seems like a good beginner’s guide to juicing and smoothies, but if you have specific health issues that you want to address, she gives you juice recipes to incorporate into your diet to do so. If you are interested in juicing or making smoothies, or in just finding out more on the topic, I’d recommend reading this book. If you are wanting to get into juicing or know someone who is, then you will probably want a copy of the book for yourself. If you have specific health issues you want to work on, you will want your own copy as well. My favorite part is actually in the introduction as she describes her reasons for doing what she does. That isn’t to take anything away from the rest of the book. It is full of great recipes for helping one get healthy and staying healthy. How many times have we heard one group of people claim that another group of people all look-alike to them? When I viewed the following photographs, I got to wondering if at some level it is because humans tend to focus on certain attributes in the other group and subconsciously don’t ‘see’ the other features that makes up the full portrait of who that person is and what they ‘look like’? I know that I don’t ‘see’ anyone in any group of people without any facial features as the altered photographs appear in the collection below, but do we take in all the identifying parts of each person when looking at a multitude of unfamiliar faces? Are we practicing a subconscious ‘identity shorthand’ when looking at strangers? Unless you consciously study other people, their countenance, their mannerisms, what they say or don’t say, how they speak, their style, and how they carry themselves, what do you see when you look at a stranger? How is it different from what you see when you look at someone you know? Would you recognize the photo of a loved one or friend with blurred away facial features? Featureless Studio Shots Of Models Are Quite Creepy | DIYPhotography.net. Posted on July 10, 2013 Categories Random Thoughts, UncategorizedTags Featureless, Strangers, UnfamiliarLeave a comment on What do you see? Audio Bible online legally listen for free? We have read through the Bible many times over the years, but now days listening to it might be easier for us to do. If you have thought about listening to the Bible but didn’t know how to go about getting started on it, the following article by Christian PF can help. Christian PF includes links to legally listen to the Bible for free. How to Listen to the Bible for Free and Change Your Life. Posted on July 9, 2013 August 25, 2013 Categories Bible Study Tool, Christian Walk, Non-Fiction, Random ThoughtsTags Audio, Bible2 Comments on Audio Bible online legally listen for free? What will the last days look like? Will some people be aware that the time is short? If there is a rapture, will everyone who goes to church be raptured with the church? There have been many writers and speakers, preachers and teachers who have shared what they believe the Bible has to say on these things. ‘A Sound Like Fire’ by KD Veron is one more voice among the roar of voices expounding upon this subject. A voice I haven’t heard of before, but his handling of the subject is done very well. Although Mr. KD Veron approaches the subject in a fictional format, he uses verses of scripture on the subject at the beginning of each chapter. I don’t know if his vision of the last days covers things correctly or not, but he presents a very strong case for being ready and real in your Christian walk. I suspect things will be worse than Mr. Veron portrays them as being in his book, but even if they are not, he shows a disturbing enough picture of those days to encourage fence sitters to get off the fence and be ready. As I read this story, I got the impression that Mr. Veron did a lot of research into various aspects of the novel that he outlines in great detail. My favorite parts are in chapters fourteen and the epilogue. It is my hope that many will read this and examine where they stand with Jesus. A few months back I read the first book in The Immortal Files series, ‘The 13th Tribe’ and found it a very interesting book. Recently I had the privilege of reading the second book in the series and even though I still feel the idea of a group of people condemned to living for centuries due to their evil acts at the foot of Mount Sinai is not biblical, I once again found myself drawn into the story and found it interesting and even encouraging in places. This book in the saga of The Immortal Files, finds Jagger, Beth, Tyler, the St. Catherine’s monks, and Owen once again battling with immortals. This time an evil group called The Clan, bursts into their quiet sanctuary and Jagger and Owen set off to protect mankind only to find that Beth, Tyler, and the monks have their own battles to fight when The Tribe drops in for a visit. My favorite part is what the judgment stone does for the characters in the story. Not just seeing angels and demons, but what they see is influenced by how close or far away from God the character is in his or her spirit. The characters closest to God see the demons as the most vile and ugly. The more evil the character, the cuter and more desirable the demons look to them. The immortals known as The Clan are even more blood thirsty than The Tribe were in the first book of the series. I recommend this as an action story with lots of little gems of truth. 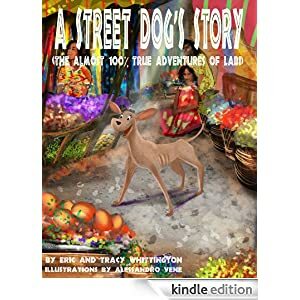 A Street Dog’s Story is a children’s book about Labi (short for la biche which is French for deer) the dog rescued by U.S. diplomats Tracy and Eric Whittington while they were working in Africa. It starts off heart breaking but ends on a very positive note. It is a delightful story with fun drawings of Labi and her adventures. There are books that are cute and fun to read, and there are books that bring awareness about things that shouldn’t be. A Street Dog’s Story combines both functions. It is written to bring awareness of the plight of animals that don’t have the security and love of having a family but it is done in a way that shows with love and care things can be better. I enjoyed reading A Street Dog’s Story and believe animal lovers all around the world will find a special place for Labi and her mission in their hearts. It is a short story only thirty-seven pages long, written for children, that adults will enjoy reading too.